There are many cultural shows in Bangkok featuring traditional Thai music and dance performances. The best Thai cultural show is the amazing Siam Niramit Bangkok Show. Khon shows are also popular and the ticket for the Grand Palace now features a free Khon Cultural show. Check below for more details. Siam Niramit is the best of the cultural shows in Bangkok. The extravagant stage show features one of the largest stage productions in the world. There are over 100 performers wearing 500 costumes during the show. 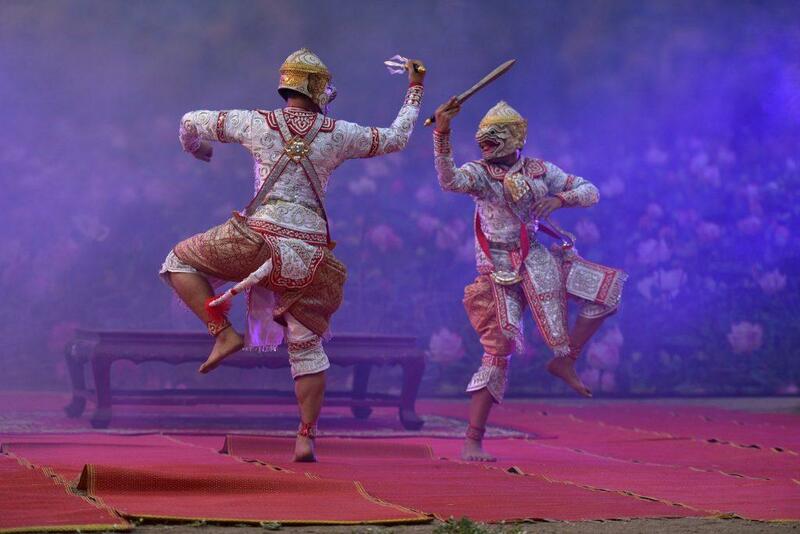 The show is an excellent introduction to Thailand’s history and culture. There are amazing special effects and stunning sets. The show comprises three acts. Firstly the history of the different regions and civilizations of ancient Siam. Secondly religious beliefs, and thirdly Thai festivals. The theatre is in a reproduction traditional Thai village complex. The village features traditional buildings from all parts of Thailand. Pre-show activities include elephant feeding & riding, outdoor dance performances, and games. There is also traditional Thai massage, and making coconut pudding. Also, rice pounding, silk weaving, Batik painting, and making shadow puppets. You can also make paper umbrellas and play traditional musical instruments. Other popular activities are dressing up in traditional Thai clothing for photos and taking a boat ride on the Khlong. There are souvenir shops selling Thai arts & handicrafts. Also, a restaurant featuring a Thai & International buffet including vegetarian selections. The buffet runs from 17.00-19.45. Walk-in ticket prices are 2350/2210-baht adult/child for buffet/show/superior seat. 1850/1710 baht for buffet/show/standard seat. 2000 baht show only (superior seat). 1500 baht show only (standard seat). Prices include a welcome drink and souvenir booklet. You can get discounted tickets by booking online. Take a round trip mini-van to pick up from your hotel. The cost is 300 baht per person. Siam Niramit is wheelchair friendly. Photography is not allowed in the theatre though you can take pictures in the village. Tip: Make sure you arrive early to explore the village properly. There are plenty of places to eat nearby before or after the show. Esplanade Mall has some good restaurants. Location: 19 Thiam Ruam Mit Road, Huay Kwang, Bangkok. Admission: Ticket prices are 2350/2210-baht adult/child for buffet/show/superior seat. 1850/1710 baht for buffet/show/standard seat. 2000 baht show only (superior seat). 1500 baht show only (standard seat). Prices include a welcome drink and souvenir booklet. Opening Hours: Traditional Village/Restaurant 17.00-20.00. Show Time: 20.00-22.00. Getting There: MRT Thailand Cultural Centre Station (exit 1). Then take the free shuttle bus that picks up from 17.15. Returns trips after the show. Taxi from central Bangkok 80-100 baht (meter). Another one of the famous cultural shows in Bangkok is the Khon (Thai classical masked dance) show at the Sala Chalermkrung Theatre every Thursday and Friday from 19.30-22.00. The show, based on the Ramakien, a Thai version of the Hindu Ramayana epic. The show, performed by a troupe of dancers in lavish costumes depicts four sets of characters. They are male, female, monkeys, and demons. The show features a soundtrack of live traditional Thai music. The story is about the eternal struggle between the forces of good and evil. Tickets are 800, 1000, and 1200 baht and can be purchased at the theatre box office. The 500 Baht entrance ticket to the Grand Palace in Bangkok now includes a Khon performance at the Sala Chalermkrung Royal Theatre. There are five performances daily of the 25-minute masked dance drama from Monday to Friday, at 10.30, 13.00, 14.30, 16.00, and 17.30. A shuttle bus is available for a one-way trip to the Sala Chalermkrung Theatre. It leaves from the Phiman Deves Gate at the Grand Palace to Sala Chalermkrung. The bus leaves 30 minutes before the start of each performance. Location: Chalermkrung Theatre, Charoenkrung Road, Bangkok. Admission: 800, 1000, 1200 baht.